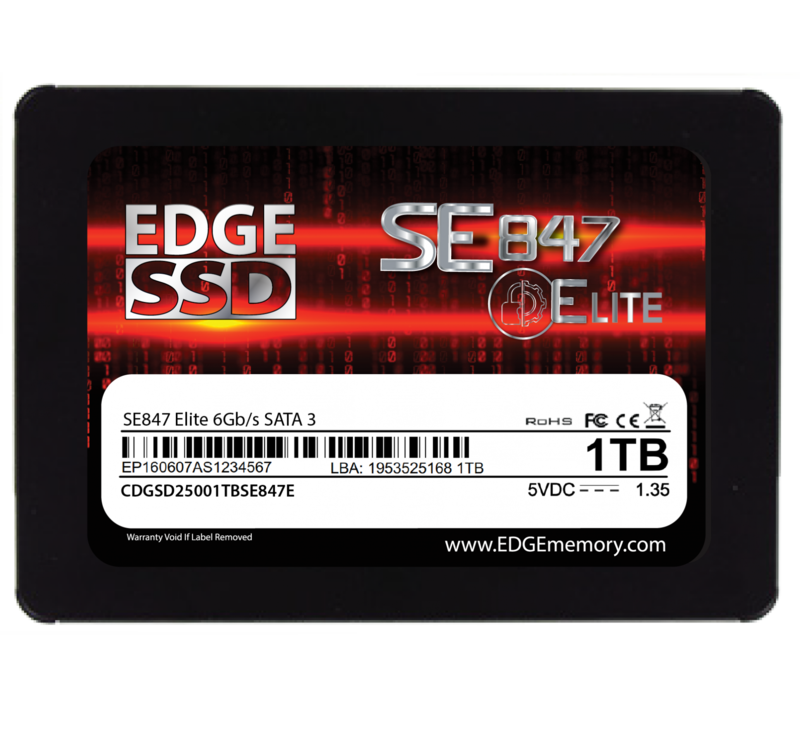 EDGE SE847 Elite SSDs are TAA compliant, built with premium controllers, and backed by a superior five-year warranty. Exclusive to CDW, the SE847 series stands at the center of quality, performance, and value. Leveraging over 30 years of industry experience, it is engineered and manufactured for the over 250,000 customers of a leading provider of integrated information technology solutions. Designed for server and data center environments, the EDGE SE847 Elite SSD delivers exceptional performance while providing valuable data security features. The SE847 Elite is a faster, lighter, more durable, and more reliable storage solution compared to traditional spinning disk hard drives. Full capacitive backup protects against data loss and corruption stemming from unexpected system power loss – a critical feature for server storage. 256-bit AES hardware encryption (Full Disk Encryption) protects stored data from unauthorized access. Utilizing a premium controller, the SE847 Elite achieves excellent read/write and IOPS speeds. Substantial performance gains in data backups, file transfers, and boot times are to be expected. A suite of additional security and durability features such as T.R.I.M., S.M.A.R.T., Secure Erase and DataRefresh further enhance data efficiency and increase the lifespan of the drive. SE847 Elite SSDs are TAA compliant, come backed by a 5-year warranty*, and include expert U.S. support. Exceptional Performance - Ultra-fast read/write and IOPS speeds – substantial performance gains in data backups, file transfers, and boot times are to be expected. External DRAM provides additional speed benefits. Feature-Rich - Includes a suite of security and durability features such as T.R.I.M., S.M.A.R.T., Secure Erase and DataRefresh, further enhancing data efficiency and increasing the lifespan of the drive. Compatible with Windows, Linux, and Mac OS X environments. Reliability - No moving parts - more durable and reliable than traditional hard drives that use a spinning disk. Equipped with Tier-1 MLC NAND flash. Secure - Full capacitive backup protects against data loss and corruption stemming from unexpected system power loss – a critical feature for server storage. 256-bit AES hardware encryption (Full Disk Encryption) protects stored data from unauthorized access. *Requires proper operating system support (i.e. Windows 7). 2TB capacity not supported.